Undoing the damage caused by concrete "flood control" engineering is no easy task, but the City of Calabasas is doing just that. 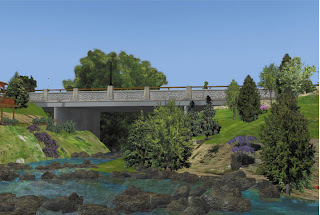 Driven by a mandate from the Regional Water Quality Control Board to solve an algae problem, and prioritized through watershed and regional planning, this project will provide significant benefits in restoring the natural function of this creek in the Malibu Creek watershed. The vision for the project is illustrated by the images below. Visit the photo gallery for more. It is encouraging to see our neighbors in Los Angeles County implementing such a bold vision! Where is the leadership in Ventura County?